Tara: How were you approached to present your work at the MR Festival? What interested you about presenting your work in this format? devynn: Enrico Wey first Facebook messaged me, asking if I was around for the festival. He didn’t say much else. It was very 2012. 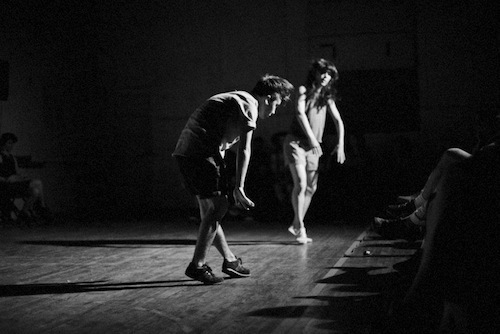 Aretha: Enrico emailed the two of us about creating a duet collaboratively, under the theme of 'sweat/effort' and 'stillness/action', within a larger curatorial framework of play and experimentation. He touched on how the festival could act as a focal point for the community to come together and embrace the wide range of outcomes of experiment-driven work, including both success and failure, and also, how it could raise issues around compensation, value and labor. Tara: Had you two worked together in the past? In what context? devynn: I created a duet on Aretha and I for the rooftop series in Bushwick. It was a lovely process that ended in conflict around time for rehearsals and money from a non- existent budget. We later worked quite intimately in Vanessa Anspaugh’s process. 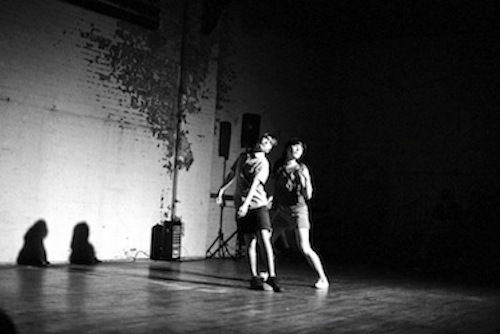 Aretha: devynn and I danced in Vanessa Anspaugh's BAX residency piece and Studio Series work. I also danced for devynn briefly in 2010. Tara: How did you start the process of making this duet? What sparked the initial movement invention? devynn: Aretha came in with ideas for text and improvisations. These are two things I usually stray away from in my own choreography. I was hoping for more structure and design. We laughed at this difference, as well as the realization that we again had little time to work together in our schedules. We also had no money to rent space, and ended up trying to work secretly in gyms until we got kicked out by an aerobics instructor, moved outside along the water of the Chelsea Piers, and in my tiny living room with my cat as an audience. Aretha suggested we include the history of our relationship, and brought printed email exchanges from the beginning of our first time attempting to work together. It felt like an honest way to approach reconnecting again. We were struggling with the improv interest from Aretha meeting the compositional pull that I am drawn to. We figured out in a few rehearsals, that we both felt most interested in a mode of improvising within a few possible ideas to return to which created a heightened listening to each other’s choices. Aretha: We emailed each other a lot and eventually met up and started improvising with each other. I'm going to let devynn handle this one. I feel like [she] really initiated a lot of this material. I will say that the process of making movement/improv structures felt really relaxed and intuitive. Tara: Financial, space, and scheduling issues are common to dancers. What made you want to include these points in the piece you crafted? devynn: The festival prompts and themes seemed to offer an allowance for honesty about the roughness that is a reality of making a work. We literally didn’t have much time, money, or space, and worked against the pressure of creating a “show”. I had to shed my old-school trained mind that taught me how to make a perfect dance that conformed to certain standards. I trust that Movement Research allows a dismantling of this model, and has for quite some time. This really allowed us to be present with each other and what we had, which at its very basic bottom is our body, it’s connections and it’s independence. Aretha: I think it was just that--that these issues are relatable, but also, devynn and I have our own specific relationship to them. And, this relationship to finances and scheduling was left somewhat unresolved until we could come together for the fest and poke fun at it a little bit. I actually think those emails [read aloud in the performance] are kind of funny and overly dramatic. I was embarrassed by a lot of what I wrote. I think laughing at ourselves helped us to come to peace with what was at the time, a disruption to our creative relationship and friendship. Tara: Why did it feel relevant for your particular event at the fest (stillness-action-sweat-effort)? Aretha: To be honest, we kept a pretty light touch on the themes of the event as we were making the work--we didn't overly discuss how the work related to stillness-action-sweat- effort--but now it makes perfect sense! I like how "action, sweat, effort" are words that relate directly the physical labour of dance-making, and "stillness", to the kind of stagnation that can happen when practical issues of finances and scheduling are left unresolved in a process. Tara: Have you denied projects in the past because of money/space/time constraints? What past experiences were you drawing from? Or, what do you do in your own creative practice to protect/ preserve yourself (and your work) financially? devynn: A wise choreographer friend recently said to me that if I don’t put myself directly in a situation where my choreography and dance practice are at the fore, than that would never be my life. This was one of those simple lessons of truth. I have always had my massage therapy practice supporting me, while squeezing in my dance career. When squeezing didn’t feel like enough, I sweat through two full- blown careers. NY ‘s way had me burn that model out really fast, so I had no option to put my dance career first. I’ve never been happier. Aretha: Coming from Canada, where artists are struggling with these issues, but no where on the level of the States, my sense is that there are some basic conversations that need to take place between dancers and choreographers so that there is a real awareness of the kind of financial landscape we're dealing with and so people can make informed decisions… talking about scheduling-- how much time dancers have for warm-up, lunch breaks-- working conditions, not just how much the pay is but when dancers can expect to be paid, all of the practical details of a process are directly related to the financial picture and they need to be talked about. Contracts aren't so popular here (they were when I was working in Canada) and maybe they don't always make sense in this community. But in lieu of that, conversations need to be had about what the choreographer and the dancer needs, and what is realistic, given the specific nature of each project. In my experience, these conversations serve the work.